A wise strategy of any Search and Rescue Team is to employ the amazing capability of search dogs. Dogs use their powerful scent capability to locate lost, injured or deceased people in the wilderness after which they return to their handler to alert him of the find. Dogs can successfully work in conditions where humans are compromised - dogs can search throughout the night without loss of effectiveness since they rely on scent rather than sight. Dogs can also find victims buried by snow, debris, dirt or water through their ability to scent. YCSRT is fortunate to have air scent certified dogs who can detect human scent from long distances, trailing certified dogs who can follow the scent of a specific person over long distances and difficult terrain and human remains detection certified dogs who are specifically trained to locate deceased persons. The dogs are owned, handled, and trained by volunteers who devote significant time and personal resources to ensure the dogs are equipped and trained to the highest standard. Prospective members should have a suitable dog not over 3 years old at least 15” tall at the shoulder with strong scent capability. The handler should be physically able to bushwhack several miles over difficult terrain and have time to devote at least 5 hours per week to train. Some personal expense will be required to acquire the necessary pack and equipment for himself and his dog. 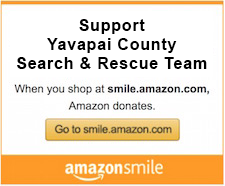 Interested parties should contact the Volunteer Services Coordinator, Yavapai County Sheriff’s Office.